NEWPORT, Ky. -- A few minutes into our tour of Mary Soller's 600-square-foot apartment in Newport, I asked her what was behind a door off the dining room: "Is that your bedroom?" "No. My bedroom is my Murphy bed. It's right there," she said, pointing back into the living room where, sure enough, a single bed stood propped up against the wall -- no cabinet to conceal it, no nothing. "I was going to sleep on the couch but thought, 'Oh, that's horrible,'" she said. "It allows for more floor space. It makes sense." So does Soller's plan to move upstairs into an apartment she's carving out of the spacious third floor and half of the second floor of the 1874 York St. Victorian she bought with her friend, Pam McFarland, in 2007. The new apartment will have a rooftop deck with a 360-degree view of the Ohio River basin communities. Just as important, it will have a full-size kitchen and bathroom and a huge master bedroom suite with a 13-foot-high ceiling and a view of the center of Cincinnati's skyline. Sure, she doesn't have a real bedroom, and her bathroom is closet-sized -- watch your head when raising up from the toilet! -- and her kitchen is just 6-feet by 6-feet. Soller, who lived in a 2,800-square-foot house in Newport's historic East Row District from 2004 until 2015, is going to love her new space, but she'll always be proud of the little one she's in now, just like she was when she signed up to be on this year's Beyond the Curb tour of homes on Oct. 1. "It's crazy, I know," she said of tiny apartment living. "During the home tour, so many people who are wanting to downsize asked me, 'Oh, my god. How did you do it?' " she said. "But it's been the best thing for me, the best thing for the property, with me being an occupant landlord who's constantly investing in it," Soller said. "For me, it was an investment and still is, but now it's my home, my way to step up for the quality of the neighborhood." She said her neighborhood, which locals refer to as West Newport, has long been neglected, but it is walkable, like the East Row -- and much more affordable. New renovation rules went into place when York Street became a historic district in January, making some changes more expensive. "But I think it's well worth it in the long run," Soller said. She and McFarland bought what had been converted from a single-family house to a four-unit apartment building years ago and went to work fixing it up for rental occupancy. They launched redo No. 2 in 2014 when Soller decided she wanted to live there. It took about a year to get it to where it is today. Over the course of Soller and McFarland's ownership, shag carpet covered the floors and had to be replaced with new oak ones. A drop ceiling came down to expose a nice surprise: Victorian chandelier medallions and plaster molding in original condition. Both the kitchen and bathroom were re-tiled and repainted. Soller went to work on the backyard, a deep space that spans the back of the house and a three-car garage that faces a back alley. Scraggly trees came down and Soller installed a central patio made from 700 antique brick street pavers she picked up for free from the city of Newport. 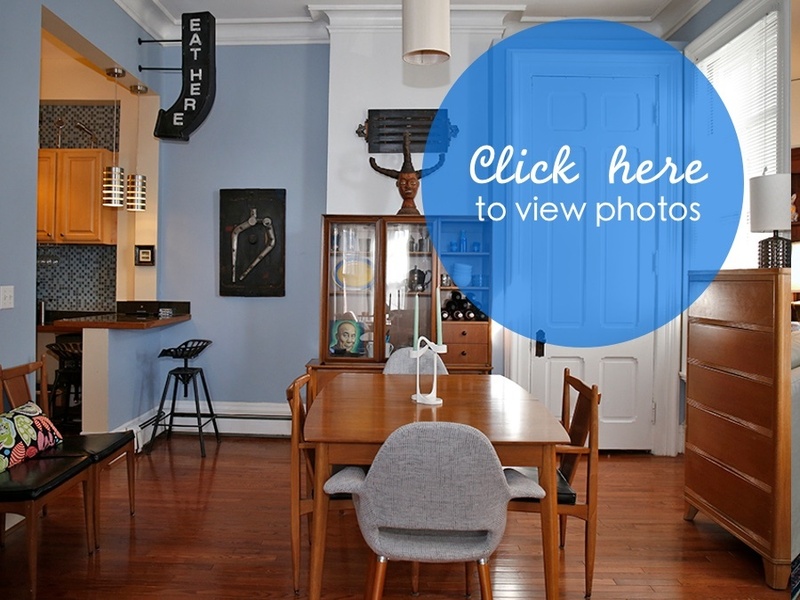 Although the 143-year-old house might cry out to be furnished with antiques, Soller chose to decorate mostly with antiques of the future: a matching mid-century hutch, dresser and table that were her grandparents'; modern works mostly created by local artists; and a funky, arrow-shaped "Eat Here" sign that points to the kitchen. Once Soller completes her new digs, she might find it easy to rent out her current apartment. "I've been thinking about when she moves upstairs to taking up the first floor," McFarland said from work via conference call. "Newport is a nice, a lovely, lovely neighborhood." And McFarland should know. If she does move into the tiny apartment, it will be a simple task. Her current home is only a few blocks away. Correction: This story originally identified Pam McFarland as Pam McDonald. WCPO regrets this error.